Diabetes Can Be Reversed With Diet. It’s No Secret. The news is not good. The Non-Communicable Disease Risk Factor Collaboration estimates that the number of people with diabetes quadrupled between 1980 and 2014. The World Health Organization used a superhero theme this year. But you don’t need to be super human to beat diabetes. A simple low-fat, plant-based diet has been shown to reverse the disease. 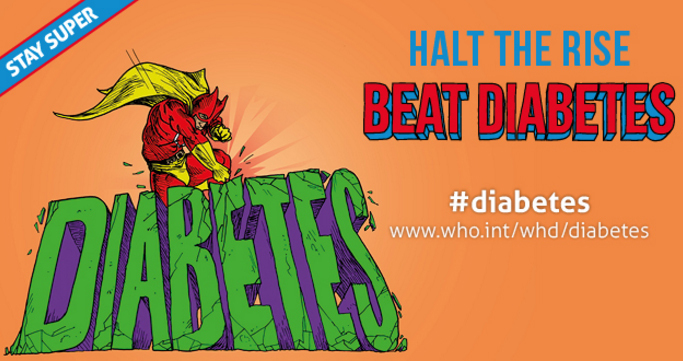 Diabetes was also the theme of this year’s World Health Day on 7 April, yesterday. About 422 million people worldwide have diabetes, a number likely to more than double in the next 20 years. I’ve worked in the field of diabetes for 20 years. Let me say this … it’s not a done deal when a doctor says you have diabetes. If you catch it early, you can reverse it. You can go off medications and have normal blood sugars. I’m not selling anything … no books, no supplements, no speaking engagements. I’m just sharing what I know. CONCLUSIONS A robust and sustainable weight loss program achieved continuing remission of diabetes for at least 6 months in the 40% who responded to a very low calorie diet by achieving fasting plasma glucose of <7 mmol/L. Type 2 diabetes is a potentially reversible condition. 7 mmol/L is 126 mg/dl. That’s the cut-off point for diabetes. Every study is a little different. It was already known that you could reverse diabetes (type 2, not type 1) with a low calorie diet and weight loss. This study wanted to see who would respond better. Responders had their diabetes for fewer years than nonresponders, so they retained good beta cell function. Beta cells reside inside the pancreas. They produce and secrete insulin. If you have diabetes for a long time, eventually the beta cells die and you have to go on insulin. (“Chronic exposure to elevated levels of glucose and free fatty acids (FFAs) causes β-cell dysfunction and may induce β-cell apoptosis in type 2 diabetes.”) So it’s important to catch diabetes early. Unfortunately, many people have it for years before they know it. The diet this particular study used was extreme, but it did the trick. I’ve seen diets used in studies that weren’t so extreme but also did the trick, also got people off their meds, lowered their weight, blood glucose, etc. e.g. A Low-Fat Vegan Diet Improves Glycemic Control and Cardiovascular Risk Factors in a Randomized Clinical Trial in Individuals With Type 2 Diabetes. I say this diet was extreme because it was mostly liquid for 8 weeks (Nestle’s Optifast) and just 600 to 700 calories a day! It’s difficult to transition from a liquid diet to normal eating. You may have lost weight and reversed your diabetes, but you’ve made no behavioral changes. You haven’t learned how to eat. One last thing. The liquid diet was 19.5% fat. That’s low. That’s where it should be, in the teens. Because too much fat increases insulin resistance. Diets rich in wholegrains, fruits, vegetables, legumes, and nuts; moderate in alcohol consumption; and lower in refined grains, red or processed meats, and sugar-sweetened beverages have been shown to reduce the risk of diabetes and improve glycaemic control and blood lipids in patients with diabetes. A low-fat, plant-based diet fits this scheme perfectly. This entry was posted in Uncategorized on April 8, 2016 by Bix.